Rauner vowed to the group that his re-election would attract more technology and manufacturing companies to the state, part of a bid for their support six weeks ahead of a vote that looks increasingly grim for the incumbent. 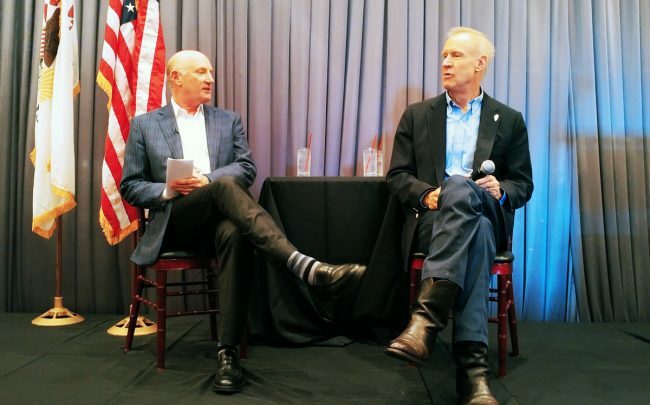 The Republican governor said Illinois “should be one of the fastest-growing states in America, right up there with Texas” — one of four times he mentioned the Lone Star State as a model during a question-and-answer session with David Kahnweiler, longtime CEO of the Chicago-based commercial brokerage Colliers International. Kahnweiler stepped back this year to the role of non-executive chairman for Colliers, but he’s still pulling levers on deals in Chicago’s suburbs, including the purchase of a 127-acre Northbrook country club. He also donated more than $40,000 to Rauner’s 2014 campaign, according to Federal Election Commission filings. On Tuesday, Rauner touted the University of Illinois system’s plan to open a research center on a 1 million-square-foot plot of Related Midwest’s “The 78” megaproject, saying it would open a pipeline for new tech companies trying to land fresh talent. Rauner also said the state is “drastically underperforming” in manufacturing growth, a problem he placed squarely at the feet of the state’s relatively union-friendly laws. Illinois was considered a contender last year for a new $1.6 billion Toyota-Mazda plant, but the companies chose to build in Huntsville, Alabama instead. The governor plugged “right-to-work zones,” an idea he’s been championing since at least 2015, as one way to lure new manufacturers. Having failed to get the state’s General Assembly to take up the idea, Rauner said he hopes the U.S. Supreme Court will rule on a pending case over whether states can bar towns from establishing themselves as union-optional zones. In 2015, Rauner recruited state employee Mark Janus to file the Janus v. AFSCME suit, which ended earlier this year with the landmark ruling that public-employee unions must give their members the option not to pay dues. When Rauner added, “But his personal behavior, his rhetoric …” Kahnweiler cut him off and moved on to the next question. The last four public polls taken of the governor’s race all show Rauner trailing Democrat J.B. Pritzker by double digits, according to FiveThirtyEight.